The role of women in Middle Eastern workplaces and governments is changing. Those in the West who haven’t had first-hand experience working in the Middle East might find these developments surprising given the region’s seemingly divergent attitudes and laws regarding gender parity. But because of the commercial imperative for diversity, there is a visible appetite for change. 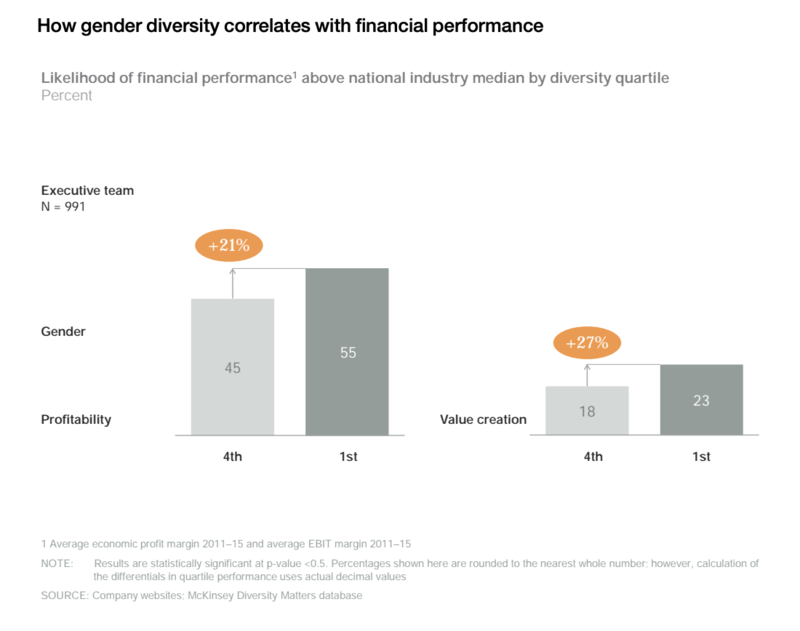 Companies in the top quartile for gender diversity are 21% more likely to experience above-average growth than competitors in the fourth quartile, according to compelling research from McKinsey. The guidance is clear: increasing gender diversity is a simple step towards better decisions and greater corporate growth. This empirical evidence, often revalidated, has led to an increasing concern in the Middle East and elsewhere that companies that do not embrace its findings, especially in changing economic times, will fall behind on performance and fail to attract top talent. So it is unsurprising that today nine of the members of United Arab Emirates President Sheikh Khalifa’s cabinet are women, and around a third of start-ups in the UAE are run by women. While the growing visibility of women in politics is yet to translate into equality legislation, there is a strong push for change from the bottom up. Despite this momentum, the culture of the Middle East is not quite at the same stage as the London insurance industry was when I first joined the latter 20 years ago, but there are analogies and lessons to be drawn. Twenty years ago, insurance in London was largely dominated by men. Discussions about recruitment or promotions often took place in the pub or at social events when people were tapped on the shoulder for a role. Leaders were men and tended to recruit in their own image from the pool around them. So when it came time for a promotion or when a significant role opened up, there may have been highly qualified women, but they simply weren’t on leaders’ radar screens. In the Middle East, where gender segregation is sometimes culturally commonplace, it can lead to similar consequences. This is why the increased number of women now in leadership roles in businesses operating in the Middle East paves the way for promoting the advancement of women, and helps unlock a broader pool of applicants for roles. Learning from what has worked elsewhere and building on the groundswell of support for change, what can leaders do to help promote gender parity in the Middle East, absent legislative intervention? Here I'll cover five pragmatic steps that all companies can take in the short term to help ensure that diversity is not simply another corporate buzzword, but becomes embedded within the DNA of an organization. Start with the “why” in communicating the commercial imperative for change, and don’t let perfection be the enemy of the good. Some may say they haven’t the proof of the need for diversity in their organization, but just look at the evidence. Others have done that research for us. Some may use excuses like, “you can’t measure gender diversity because the data isn’t available”, but you don’t need data to see if your leaders are male or female. That’s the great thing about gender diversity - it’s obvious whether you have it or not. Don’t allow people to make excuses for not being able to start moving the dial. You need to have a diverse range of people entering your organization to build diversity within it, and you also need to retain the women who are there. Make sure your training and development is relevant and available to all, and be aware that flexible and agile work environments help ensure that the pipeline you’ve built is not eroded when women have children. The most simple and cost-effective way to build diversity is to make sure you have a diverse slate of people when selecting people for promotion, especially into senior roles, or recruiting applicants from outside. Take time to find a suitably qualified pool of applicants and if the pipeline doesn’t yet exist, don’t be afraid to look outside your organization. And ensure that the selection panel is in itself diverse. Diverse selection panels encourage debate and minimize the impact of both unconscious bias and the risk of a sole decision-maker recruiting in their own image. Remember to think about the teams into which you place people. You need diversity of thought for good decision-making, so it’s not just about recruiting women. The benefits of gender parity work both ways. There might be little point putting a woman on an all-female team. You may need a man to broaden perspectives. As leaders and role models, we all have valuable life lessons to share and guidance to give that can help shape our future leaders, but it takes time and commitment. Counselling and showcasing best practices and behaviours (mentoring) and sponsoring young talent for stretch assignments or roles is more valuable than any costly external coaching or training, though these too have their place. The research is out there - diversity makes sound commercial sense. If we deploy these simple tactics, we can all help move the dial.